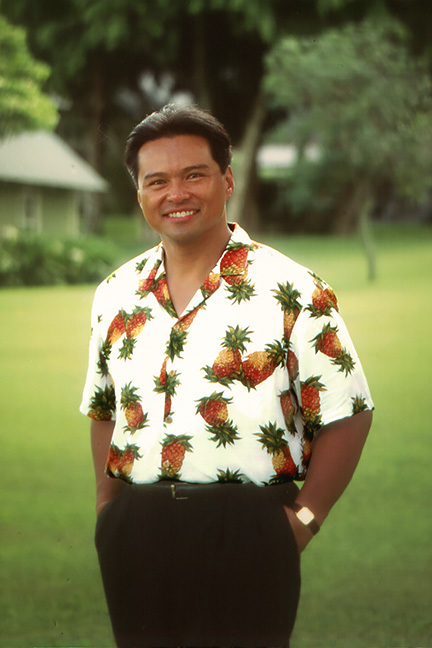 I was born and raised on Lana`I, where my parents raised seven children. Six girls, and one boy — me!. My wife and I now live on the island of Maui. Papa worked in the Dole Company's power plant and Mama owned and operated a bakery. We may not have been rich in material things — but we were content. Lana`i does not have shopping centers — we have great mom and pop country stores. We still have one movie theater — one gas station. We may not have things that many people take for granted, but we have always had family and friends. We found ways to entertain ourselves. Papa played the Hawaiian Steel Guitar, and Mama accompanied him with her Ukulele. Together the whole family sang Filipino and Hawaiian songs. We also had Scouts and Little League. I played center field, and Papa coached. As I matured, it became obvious that I was not going to be a professional baseball player! My love for music that was born and nurtured in my family inspired me to continue in a most enjoyable music career. When I graduated from high school in 1970, I decided to attend college in Honolulu, majoring in music with an emphasis in voice and a minor in piano. Ultimately, I wanted to teach at the secondary level somewhere that was culturally very different than Hawaii. When I finished college, there was a surplus of teachers. The tourist industry was flourishing, so I changed my plans. I returned to my home island and worked for Hawaiian Airlines.